Falls Are A Leading Cause Of Traumatic Brain Injuries | Hupy and Abraham, S.C.
Falls are the leading cause of traumatic brain injuries, according to the Centers for Disease Control and Prevention (CDC). The CDC reports that traumatic brain injuries caused by fall accidents result in more visits to emergency rooms and more hospitalizations than traumatic brain injuries caused by any other type of accident. Hit her head on something sharp. A sharp object may penetrate the skull and create an open head injury. Hit her head on the ground or another object. Whether you fall and hit your head on the ground or on another object on the way to the ground, you could suffer a direct impact injury to the head and brain. Hit her head hard enough that the brain is shaken against the skull. This may result in a closed head injury or a coup-contrecoup brain injury. Any type of traumatic brain injury is a medical emergency. If you or a loved one suffers any symptom of a brain injury, then you need to immediately seek medical attention. 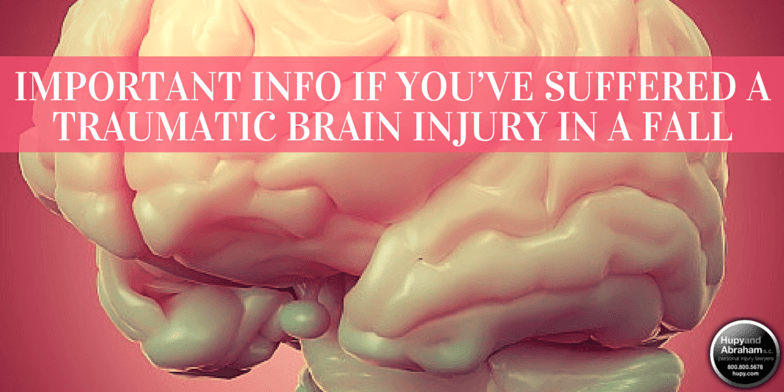 Could You Have Suffered a Traumatic Brain Injury in a Fall? Inability to focus his eyes. Loss of interest in playing with favorite toys. While any of these symptoms may be a sign of a potential brain injury, only a doctor can make an accurate diagnosis. The first thing that you should do after a slip and fall accident is to see your doctor. Then, as you continue to follow your doctor’s treatment plan for your fall injury, it is important to protect your legal rights to a fair financial recovery. If the negligence of a property owner or manager caused you to slip and fall and suffer a traumatic brain injury then you may be able to recover compensation for all of your medical bills, lost income, pain, suffering and other damages. Please contact us today if we can help you on the road to recovery.